Kiara Designer Suites is also known as KDS. It is a development by Sunrise Bhd. on 3 acres of freehold land. Kiara Designer Suites is a 29-storey block housing 324 premium suites and 14 additional cabana suites lining up on its recreational level deck. Residents are able to enjoy a lifestyle with its stylish architectural design, modern landscape and an array of fashionable features. 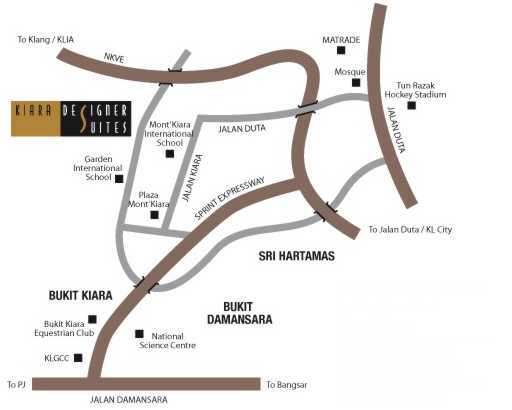 Kiara Designer Suites is located at Jalan Kiara 3, nearby Garden International School. The suite sizes in Kiara Designer Suites range from 1,128 to 1,428 sq ft. with 10 different layouts to choose from. Although Kiara Designer Suites is located outside Kuala Lumpur City, it is easily accessible via NKVE and SPRINT Highways, Sri Hartamas, Jalan Duta and Jalan Damansara. Residents can also easily reach their daily needs and favourite shopping centres such as IKEA, I Utama Shopping Mall, MidValley Mega Mall and others as well. Kiara Designer Suites was completed in 2007.